Top : Designers : Navgathi Marine Design & Constructions Pvt. Ltd.
A pool of professionals who have worked across various countries like S.Korea, Japan, Netherlands, Singapore, with reputed ship yards, designers, and owners joined forces to cater the dynamic growing market of Asia, and rest of world by utilizing skilled engineers, work forces and highly equipped facilities in India for customizing and providing design solutions and fabrication of vessels as per clients requirements are very economical costs. 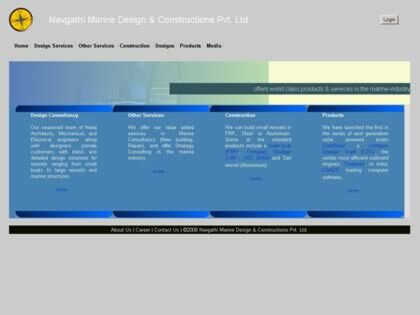 Web Site Snapshot: If available, above is a snapshot of the Navgathi Marine Design & Constructions Pvt. Ltd. web site at http://www.navgathi.org as it appeared when this site was added to the directory or last verified. Please Note that Boat Design Net has no involvement with the above web site; all content and images depicted in the above thumbnail are the property and copyright of Navgathi Marine Design & Constructions Pvt. Ltd. unless otherwise noted on that site. Description: A pool of professionals who have worked across various countries like S.Korea, Japan, Netherlands, Singapore, with reputed ship yards, designers, and owners joined forces to cater the dynamic growing market of Asia, and rest of world by utilizing skilled engineers, work forces and highly equipped facilities in India for customizing and providing design solutions and fabrication of vessels as per clients requirements are very economical costs. Visit Navgathi Marine Design & Constructions Pvt. Ltd.